The Renewal Workshop partners with apparel brands to recover the value in their unsellable returns and damaged product so it can be sold again, creating a circular economy for the apparel industry. Their proprietary Renewal System takes this product, typically bound for waste streams, and processes it into renewed apparel, upcycling materials or feedstock for recycling. Data is collected on everything that flows through the system and is shared with brand partners to help them improve the production and design of future products. The data also allows The Renewal Workshop to quantify the positive environmental impact of extending the life of a garment. Renewed apparel is sold direct-to-consumer on their website, in selected stores, or back to the brand. The Renewal Workshop is a certified renewal partner to their brands and their accompanying labeling in the garment acts as a seal of trust and quality. The Renewal Workshop operates a zero waste circular system that recovers the full value out of what has already been created as a way of serving customers, partners, and planet. 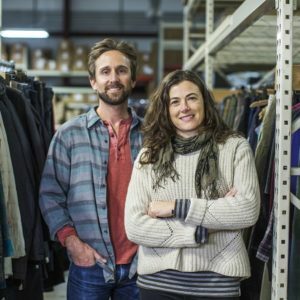 Co-founders Jeff Denby and Nicole Bassett are impact-motivated and dynamic leaders with deep roots in the apparel and sustainability industries. Jeff came to this work after building and exiting PACT, an apparel brand that mass-produced organic cotton basics in transparent and fair trade supply chains around the world whose customers include Whole Foods, Nordstrom, and Amazon. Nicole previously managed social responsibility at Patagonia, after which she acted as the Director of Sustainability at prAna and served as a Consultant on labor rights, living wage, and environmental standards to a variety of corporate clients. The company’s unique industrial renewal model has the potential to divert some of the 30,000,000 unsellable clothing items per year in the US and reintroduce them into the apparel market. The Renewal Workshop intends to divert over 1 million pounds of apparel by 2020 and save over 4 billion liters of water, eliminate 1.75M kgs of carbon, and over 1M kg of toxic chemicals.